In November, I made an attempt at a top 5 list of sandwiches. I could only manage four. There were suggestions from the three people that read this, but not having tasted their suggestions, I left the list untouched. Then, in a flash of genius, nostalgia, or whatever else you'd like to call it, the fifth popped into my head yesterday: the California Chicken Sandwich from Powelton Pizza. How could I forget such a simple and unhealthy creation based around the chicken cutlet? In college, if I ever needed respite from cheesesteaks (seems unlikely, but if you sweated whiz like I did, you'd do the same), this would be the order. 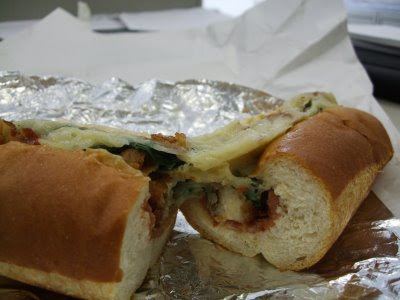 Chicken cutlet, spinach, bacon, mozzarella cheese, fresh garlic, and tomato, artfully shoehorned into a hoagie roll. Almost 10 years out of college, I reunited with this magical foodstuff once again, and I am happy to report that it's just as good as it was back then, and that Powelton Pizza, located across the Schuylkill on 37th and Lancaster, will deliver to Center City. Buen provecho. You can get your own damn California Chicken sandwich (and you should, immediately) by calling 215-387-1213. Alternatively, you can order from campusfood.com or walk yourself over to 3651 Lancaster Ave.
¡Me pasaron por la piedra!